My name is Cesar Aquilino. I am an amateur photographer. 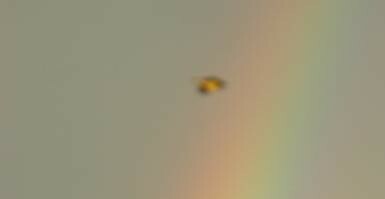 One of the pictures included in my report of the rainbow show some an unknown flying object. 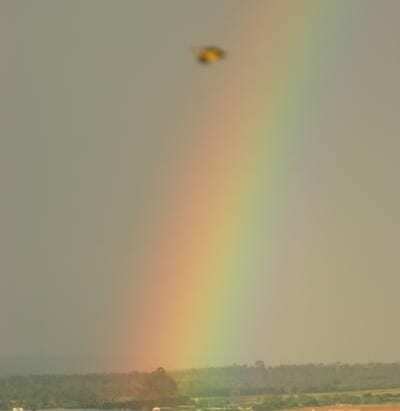 At the time I took the photographs, I was only looking at the rainbow, and did not see the object. It was an accident that I captured the unknown object in the photos I took in Avare, Brazil, on 11-15-05. The photographs are in their original content, no editing, and all EXIF info is there. I still have the original photographs in the memory of my camera, a Canon EOS 20D.